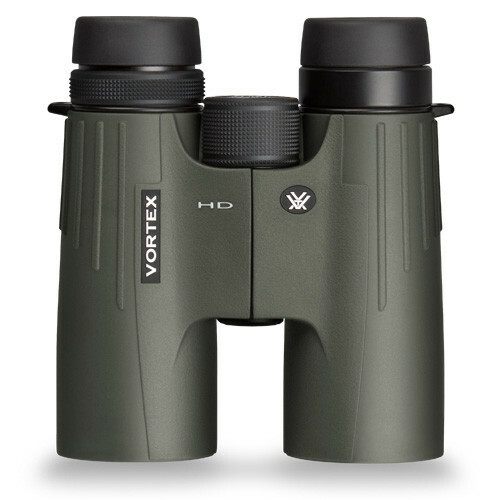 Whether you need a pair of binoculars for bird watching or to accurately sight small and large game at a distance, this pair from Vortex Optics might be just what you are looking for. The binoculars are designed to provide you with a dependable performance in all environments, and comes with a durable construction that will last for years. The O-ring fits securely around the lenses to prevent dirt and debris from getting in, and this also keeps moisture out so you can always clearly see objects at a distance. You also have the added advantage of the argon gas treatment which effectively prevents water and fog from clouding the lenses. With the tightly sealing O-rings these waterproof binoculars can even go with you on fishing trips. Hunters and bird watchers know that the best time to sight prey or a rare species is in the early morning when the light is low, but this can also make it difficult to see the target. Vortex Optics has taken care of this problem with the Viper HD binoculars. The glass lens are multi coated to increase the light transmissions so you don’t have to worry about missing anything even if the sun isn’t up. The prism coatings ensure that the images are bright and clear, and that every color is true to nature so you can immediately identify what you see. Be the first in the group to spot a rare bird or butterfly, and hunters will appreciate getting a clear glimpse of their target. One of the main advantages of the Viper binoculars is how sharp and clear images appear. Markings on feathers are clearly defined, along with targets so you can easily make a humane killing shot. The high density glass is designed for low dispersion which makes the binoculars ideal for use in dim light. Since it doesn’t disperse the available light, images are brighter and clearly defined. With this pair of high definition binoculars there is almost no limit to what you will be able to see. Vortex Optics understands the needs of its customers and knows that you don’t want to pay extra for the basic essentials. These high definition binoculars come with a protective rain guard and lens caps that are conveniently tethered so can easily snap the covers back on the lenses when it is not being used. The included neck strap is comfortable to wear and makes it easy to carry the binoculars with you when you are hiking through the woods. The convenient strap also leaves your hands free which is always an advantage when you are hunting or hiking. As an added bonus these binoculars also come with a padded case, which is perfect for traveling and storage. No matter how durable a pair of binoculars are problems with construction and damage can occur, which is why Vortex Optics has backed this pair with a lifetime warranty. This warranty covers every aspect of the binoculars, including the lenses and O-rings. If there is ever a problem the warranty ensures that it will be quickly resolved to your satisfaction. You will also appreciate the friendly and helpful customer service department that will repair or replace the binoculars without asking any questions or requiring registration. These binoculars from Vortex Optics are designed to provide you with a reliable performance in all types of environments. You will appreciate being able to see images clearly even in low light. The glass lenses are designed to provide you with high resolution images that are true to color. Everything you need to care for the binoculars are included with your purchase. Vortex Optics believes in 100 percent customer satisfaction which is why these binoculars are backed by a lifetime warranty. On occasion dirt and debris can become trapped in the eye ring, which can interfere with your field of vision. This and other issues can be easily resolved simply by contacting customer service and taking advantage of the included lifetime warranty. Finding a durable and high performance pair of binoculars just got easier with the Viper HD from Vortex Optics. Every aspect of these binoculars is designed to provide you with high definition images that are clearly defined and true to life. The glass lenses are capable of increasing the light transmission so you can clearly see objects when it is still dark outside. This makes the binoculars perfect for early morning bird watching sessions or for catching prey while it is foraging. The durable construction ensures that the binoculars can withstand almost any environment, including exposure to water and early morning fog. You also have the advantage of the unlimited warranty that protects the binoculars for as long as you own them, and the included extras are always a welcome bonus.